In this stage of the meditation we deliberately call to mind someone we are in a state of conflict with and we wish them well. This may be someone we are merely irritated with, or there may be a more deep-rooted conflict. Here we are meeting our ill-will head on. Metta, or lovingkindness, is the emotional opposite of ill will, and so we are consciously evoking the image of someone we usually respond to with feelings of aversion in order that we can overcome them. This doesn’t mean that we cultivate ill will in order to deal with it! It’s enough simply to call to mind someone we have difficulties with, and to wish them well. You can listen to an MP3 guided meditation that will lead you through the first four stages of the practice by clicking on the player at the foot of this page. Stage Zero, as you’ll know if you’ve been working systematically through this guide. is the initial stage of meditation, before the stages proper, in which we set up conditions that help the meditation practice to go well. In stage zero first set up your posture, and deepen your awareness of your body, taking your awareness into every muscle and relaxing as best you can. If you’re not sure about meditation posture then check out our posture workshop. Having developed greater awareness of the body, next become aware of your emotions taking your awareness to your heart, accepting whatever emotions you find there, and then beginning to wish yourself well. 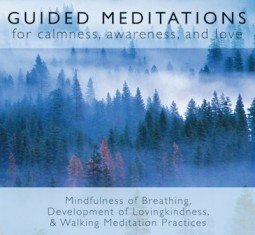 You can use any of the methods for cultivating lovingkindness that we outlined in earlier sections of this meditation guide. Once you have spent maybe 5 to 10 minutes wishing yourself well, move on to the second stage. In the second stage of the meditation practice, think of a good friend, and wish them well. Decide in advance who you’re going to pick, otherwise you might waste time in indecision during the practice. Next, call to mind someone you have little or no emotional connection with. Perhaps this is someone you see working in a store, or that you pass on the street. It doesn’t matter if there is some feeling — the main thing is that you neither really like nor really dislike this person. Once you’ve called this person to mind, wish them well, using words or phrases, or your imagination. Then we cultivate Metta for someone we don’t get on with. It may be someone that we have long-standing difficulties with, or it may be someone that is normally a friend, but we have difficulties with them just now. Call the difficult person to mind, and be honest about what you feel. There may well be feelings of discomfort. Notice any tendency you may have to think badly of that person, or to deepen the conflict you have with them (for example, by getting into imagined arguments with them), and let go of those tendencies. I’m having some difficulty choosing a ‘difficult person’ to wish well in this stage… I can’t think of anyone with whom I have any significant difficulties right now. Could I pick someone I have had troubles with in the past but am no longer in any contact with? reflection to create the opportunity to deepen our own understanding of ourselves. I agree completely, and in fact I discuss this phenomenon (which is called “psychological projection” in the context of the first stage of the practice. It would make sense for me to write something about this in the fourth stage as well, especially given that people won’t read all the materials on the practice in order. Also knowing that even if someone has qualities that are detrimental, that your souls are made of the same stuff and that you’re equal might help. They are putting themselves in pain for doing those things they do wrong so love them and try to teach them as if they are your child, because your child’s soul is made of the same stuff as theirs. It sounds like you’re blaming your mother, Redhen. It would be good to realize that she too is suffering, and that she’s not deliberately trying to make life hard for anyone. Dementia could happen to any of us. Try imagining that your mother is you, and treat her as you would like to be treated if you were in her situation. That’s a very good question. I’d say yes, but there are different reasons for fearing someone, and those situations may require more than just metta. So the most basic situation is when someone’s not being abusive in any way, but we’re afraid of them. That involves a lack of metta, because we’re usually assuming that the other person harbors critical thoughts about us. People describe this as a lack of self-metta, but to an even larger extent it’s a lack of trust in others. The situation you describe is more complex, because there is abuse going on, even if it’s emotional and verbal rather than physical. (And I’m very sorry to hear about the past physical abuse.) So there too, yes, it’s useful to develop lovingkindness toward anyone, including someone who’s abusive to you. But that’s not enough. It might help you feel a bit better at times, but it might be a way of assuming that you’re responsible for the situation, and it might keep you in a situation that you’d be better off leaving. I think that actually you need to work on being kind and compassionate to yourself, and that would inevitably include asking whether you should extract yourself from the relationship. Typically there’s a lot of fear about leaving abusive situations, partly because there’s the worry about the other person reacting angrily or even violently, and also fear arising from a lack of self-worth. But, believe, me, you’re worthy of being treated with respect and kindness. Everyone is. Have you talked to a therapist or counsellor?